Plumas-Sierra crews install fiber line at Gold Mountain. Less than a generation ago, most in Rural America were just hearing of something called “The Internet of Things” – a virtual door to a limitless world of information reached through one’s phone line and computer. Family and friends in cities were sending and receiving email messages, and “surfing” pages on the internet in the early 1990s, but the technology had not yet reached rural homes and businesses. When the internet did arrive, connections were slow (by today’s standards) and noisy. A computer literally dialed in to its internet connection with a speed of 56 kilobits compared to an average of 7.68 megabits per second now for the state of California. It was not uncommon to do a chore around the house or get the mail while waiting for a single page to load. Since most folks did not yet have mobile phones, you would not be using the house phone while on the internet, unless you invested in a second line. Oh how the times have changed. In 1995, Plumas-Sierra Telecommunications saw the need to bring internet services to our members and local communities. Technology was changing almost monthly and PST saw that bringing the internet to our area was something that needed to be done. One of Plumas-Sierra’s goals is to improve the lives of those it serves. Etablishing internet services to our rural area fit into that mission perfectly. After months of research and presentations to the board of directors, along with significant interest from our membership, PST recieved authorization to begin offering dial-up service. By the end of 1996 we had more than 1,000 customers. Flash forward to today, Plumas-Sierra Telecommunications is implementing innovative technology in order to bring reliable and affordable internet services to our members and our communities. We are living in a time where information is at our fingertips and “Google” has become a verb. We are able to connect with each other at the click of a mouse or the touch of a button. The need for high-speed internet access is no longer a situation of want, but of need. Plumas-Sierra has found creative ways to bring high-speed internet to its customers. We have utilized abandoned TV coax cable systems, satellite, and fiber in order to bring internet to our members and customers. In 2010, through the American Reinvestment and Recovery Act (ARRA), Plumas-Sierra Telecommunications received a grant to build the back bone of our fiber system that serves as the core of our communications infrastructure for the region. The challenge and cost of digitally connecting rural America should not be minimized. If rural broadband were easy and cheap, we would all have it by now. In large regions with few people, the wires and signals have to travel farther, and there are fewer people to pay for the whole system. Simply put, broadband costs more in rural areas. The high cost of rural broadband deployment remains the biggest obstacle to successfully closing the digital divide. Rural service territory is often remote and in the case of PST, covered in trees, which drives up the cost of deployment. At the same time, there are fewer customers to defray the costs. However, over the last several years, we have seen some progress in bringing high-speed internet to rural areas thanks to federal grants and low-interest loans from the Rural Utilities Service and the National Telecommunications and Information Administration. In the last spending bill passed through Congress, $600 million was allocated to fund rural broadband development. PST was one of the first to bring broadband to its rural area. Now, nearly 100 electric co-ops across the nation are reinvesting in rural America by bringing high-speed internet access to rural homes, businesses and schools. These newly connected co-op communities are proven to create jobs, attract new employers and jump-start local economies. Here in our communities, PST hopes to make the option of telecommuting a reality and provide businesses the services they need to operate in an economy that has become dependent on the ability to access high-speed internet. Plumas-Sierra Telecommunications continues to strive to meet the needs of our communities. 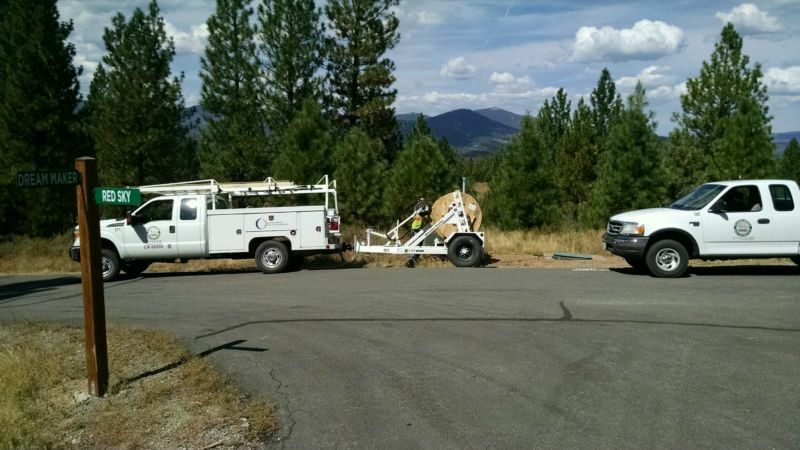 As we look forward, PST continues to repair the coax system in Quincy including West Quincy and Chandler Road and upon completion of the repairs will start upgrades and repairs to the coax system in Loyalton and Sierra Brooks with Plumas Pines to follow. Plumas-Sierra Telecommunications is currently applying for additional grants to help fund expansion into other unserved areas that are hard to reach. For more information, give us a call at (800) 221-3474 or view our service offerings.